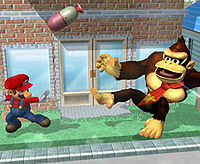 Mario and Donkey Kong are pushed apart after a ground release in Melee. Marth performs a zero-to-death grab release chaingrab on Ness in Brawl, taking advantage of his additional frames of ground release animation. Grab release is the animation that characters enter when they are freed from a grab without entering knockback. Normal grab release occurs after a certain amount of time if a grabbed character is not thrown (this time can be shortened by button mashing), but characters also enter grab release when the grabbing character enters hitstun or the platform they're standing on disappears. There are three main types of grab release animations: ground release, air release, and pummel release. Many combos can be performed by attacking when an opponent is stuck in the frames of their grab release animation. There are no grab releases in the original Super Smash Bros., where waiting too long will just result in a forward throw. The exception is Donkey Kong, whose forward throw can be mashed out of. 3 Grab releases in the original Super Smash Bros. Ground release is the animation a character enters when they break out of a grab sliding backward along the ground, along with a "letting go" animation. The grabbing character may slide backward a bit as well. The distance sent is affected by the grabbing character and the victim's traction. A ground release causes both characters to be stuck in 30 frames of ending lag where they cannot react, with a few exceptions (see below). A ground release occurs when the grabbed character's feet are touching the ground and not moving around while being grabbed. Air release is another animation a character can enter after escaping from a grab. In an air release, the grabbed character performs an arch-like movement backwards into the air, along with a "letting go" animation. The distance sent is character-specific and can be affected by air speed, falling speed, and falling acceleration. Much like with ground releases, the grabber is stuck in 30 frames of lag (except for Bowser in Melee and Brawl) although the amount of time the grabbed opponent is stuck in lag depends on the game. In all games, the grabbed opponent can force an air release by pressing the jump button or up on the Control Stick shortly before being grab released granted that the grabber is not pummelling them. In Melee, the direction the grabbed character moves can be altered slightly by pressing left and/or right. An air release causes the grabbing character and the victim to be stuck in 30 frames of lag. An air release will only occur if the grabbed opponent forces it. Because of these properties, air releases are fairly inconsistent and have little practical use in competitive play. One character who can make use of air releases is Bowser as his grab release animation is only 20 frames long giving him 10 frames to act before his victim can. This can allow him to regrab his opponent if they are air released into a wall such as in Pokémon Stadium. In Brawl, air release mechanics were heavily altered. The victim is now stuck in 50 frames of lag (49 in Jigglypuff's case) when being air released and the victim can no longer alter their trajectory by holding left or right. Because of this, the grabber now has a 20 frame advantage (30 in Bowser's case) when air releasing an opponent. In addition, an air release will always occur if the victim's feet are not touching the ground granted that the grabber is not pummelling. Taller characters tend to be able to air release more characters and are more vulnerable to ground releases, and shorter characters tend to be able to ground release more characters and are more vulnerable to air releases although there are exceptions. However, the grabbing height of a character can be different depending on the direction they are facing, as well as whether a standing grab, dash grab, or pivot grab is used; a character could be air released facing left and ground released facing right, and vice versa. Characters are also more vulnerable to air releases if they are grabbed in mid air. This can allow smaller characters to air release other small characters and it can allow taller characters to force more characters into an air release. Yoshi and Snake are unique as they can force the entire cast into an air release. Because of these changes, air releases can be abused far more making them a viable strategy in competitive play especially since most kill confirms out of throws were removed due to the general physics changes. While only a few characters can be affected by grab release combos, some characters can be abused more than others most notably Squirtle, Meta Knight and most of all Wario. On the flip side, some characters who can abuse aerial grab releases the most are Snake, Yoshi, Marth and Captain Falcon due to the former two having the most versatile grab releases while the latter two are fast and have good attack speed. Grab release mechanics remained mostly identical in Smash 4 although one significant change is that the victim is only stuck in lag for 40 frames allowing them to act 10 frames sooner. Because of this, even fewer characters can be affected by grab releases and only a few characters can even get a grab release follow up in specific matchups. To further exacerbate this issue, the victim can no longer be regrabbed due to the removal of chain grabbing. Because of this, air releases are significantly less useful than they were in Brawl and are very rarely used as an intentional strategy in competitive play. Prior to update 1.0.4, Wario had a similar grab release animation to Brawl (Mega Man also had a similar grab release animation) which could be abused albeit not to the same extent as in Brawl although in both Wario and Mega Man's case, their air release animations were altered in version 1.0.4 making them far less vulnerable to followups. The mechanics once again remain very similar in Ultimate although now, an air released opponent is stuck in lag for 30 frames like in Melee giving the grabber no advantage over the victim. This was likely done as the universally increased dash speeds and reduced jumpsquats would have opened more opportunities for grab release combos to be performed if the grabber had a frame advantage over the victim. This removes all possible guaranteed follow ups unless the opponent flies into an item with an active hitbox or a hazard. Snake is the only character who could feasibly use an aerial grab release to his advantage if his opponent lands into one of his self detonating explosives although this is extremely impractical to set up and feasibly achieve in a match especially compared to the simple followups he had in Brawl. The pummel release is a type of grab release very similar to the ground release, but it occurs when the grabbed character is pummeled right when or right before they are grab released. A pummel release can occur even if the character would normally be air released, and a pummel release cannot be forced into an air release by pressing up or jump. The distance sent by a pummel release can be different than the distance sent by a ground release, as a pummel release will cause normally air-released characters to fall to the ground without sliding backward. When the grabbing character and/or the victim enter knockback, the victim will receive an additional 3%. If only the grabbing character is hit, the grabbed character will also enter an animation similar to a ground release. If the platform the grabbing character stands on disappears, the victim will receive 3% damage and the grabbing character will be sent away in an arc similar to an air release. If the grabbed character is lifted up by the platform they are hovering over, they will eventually break apart from the grabbing character and both characters will enter an animation similar to a ground release. In Super Smash Bros. Ultimate, in the event that two characters attempt to grab each other simultaneously, both characters undergo a grab release animation and take 1.2% damage. In previous games, simultaneous grabs result in one character's grab being successful, determined by port priority (in Brawl and earlier games) or randomly (in Smash 4). When Bowser grab releases a character, his animation is 10 frames shorter than all other characters'. Donkey Kong's ground release animation is 9 frames shorter than all other characters'. Yoshi will always air release his grabbed opponent, sometimes in a different path than the character would normally take. Despite his size, Yoshi is one of the most vulnerable characters to air releases. Snake will also always air release his grabbed opponent although unlike Yoshi, he can't air release them while pummeling. Snake's opponents will be air released higher than they usually would by other characters. Snake and Yoshi are the only characters who are capable of forcing every character into an air release on stage. When Bowser grab releases an opponent, his animation is 10 frames shorter than normal. Donkey Kong's ground release animation is 10 frames shorter than all other characters'. When Donkey Kong grab releases a character using his cargo throw, his animation is 10 frames shorter than the usual 30 frames of lag. His cargo throw will always release the opponent in an animation similar to a ground release, even if an air release is forced or he is in the air, and the opponent can alter their path slightly by moving the Control Stick left and right. Additionally, it deals 6% to the grabbed character. Ness and Lucas' ground release animations are 10 frames longer than normal, making them susceptible to grab release combos from almost every other character. These additional ten frames are a frequently cited reason for their poor tier placements. Wario's air release travels vertically instead of in a backwards arc like all other characters, leaving him vulnerable for 20 frames in front of the grabbing character. This is due to his exceptionally high air friction, normally notable for aiding his aerial maneuverability. Jigglypuff's air release is 1 frame shorter than normal, though this has no real practical effect. Several fast-fallers, such as Fox, Falco, and Sheik, tend to land before their air release animation ends and so can act quicker. The arc that some characters travel in during an air release can leave them more vulnerable to followups depending on how narrow their arc is, leaving them closer to the opponent. Wario's grab release animation appeared to work identically to how it did in Brawl, until update 1.0.4, where his grab release mechanics have been fixed. Mega Man's grab release animation was very similar to Wario's in earlier versions of Smash 4 although much like Wario, it was fixed in update 1.0.4. Yoshi and Wii Fit Trainer can force every character into an air release due to their unique grab animations. Yoshi, Wii Fit Trainer and Snake all maintain the ability to force every character into an air release. If Bowser ground releases his opponent, he can get a guaranteed dash grab, allowing him to perform a grab release chain grab. He can also infinite some characters against walls, even with an air release. The lack of buffering with the time variance in grab releases makes the timing on it extremely difficult to consistently utilise however, and thus the few competitive Bowser players in Melee make use of it. If Donkey Kong is ground released, he can get a guaranteed jab, down tilt, forward tilt, or a grab (only on some characters). The same note above about the lack of buffering applies to Donkey Kong as well, and thus competitive Donkey Kong players in Melee don't make real utilisation of their grab release potential either. The Ice Climbers can perform infinite grab release chain grabs on every character (except for another pair of Ice Climbers). This is performed by forcing a ground or pummel release and grabbing the victim with the other climber during their lag animation. It is not very practical, however, due to their other infinite chain grabs, which deal damage much faster. Yoshi can perform a grab release chain grab on half the cast by releasing them (which is always an air release) and performing a dash grab. He also has a guaranteed up smash on some characters, and a forward aerial meteor smash on some characters as well (such as Meta Knight). Since Wario's air release sends him vertically right in front of the opponent, after performing an air release, Wario is vulnerable for at least 23 frames (20 frames spent in air release, as well as 3 frames of startup before the invulnerability frames of an air dodge) in front of the opponent. As a result, the opponent can hit Wario with any air attack or ground attack with sufficient vertical reach (such as King Dedede's up tilt) that is fast enough. An air release on Wario can be used to start a combo or land a KO move. Certain characters can also perform an infinite grab release chain grab by grabbing Wario during his vulnerability period. If Ness and Lucas are ground released or pummel released, they are left vulnerable for at least 11 frames (10 frames spent in grab release plus 1 frame of startup before being able to spot dodge or attack). They be hit with any attack with low enough startup lag and sufficient horizontal reach, and can be grab release chain grabbed by some characters. The grab release can lead to a damage-dealing combo or KO move. They can also be zero-death grab release chain grabbed by Marth and infinited by Donkey Kong's cargo throw. Characters with unusually low-traveling arcs when air released, such as Fox, Falco, and Sheik, are left in more disadvantageous recovery positions when air released offstage. Squirtle can be combo'd out of a grab release, and chain grabbed using a dash grab by several characters, and infinitely air released by Zero Suit Samus due to its unusual air release. Squirtle can also ground release into a jab on many characters. With proper timing, Captain Falcon gets a guaranteed forward aerial on air-released Ness and Lucas. Meta Knight can be comboed out of a grab release and chain grabbed by many characters when air released, most notably by Marth. The grab release glitch is a glitch that prevents certain characters from using their up special moves again when grabbed after or while using them, followed by an air release without pummeling. This technique can be deadly when used at the ledge. Both chaingrabbing and grab release combos have been mostly removed in Smash 4 due to some core game mechanics being changed. Opponents are now immune to grabs for one second after being grab released and opponents can act out of an aerial grab release 10 frames sooner. However, there are a few exceptions. Wario's grab release animation prior to update 1.0.4 was identical to its Brawl iteration besides from him being able to act out of it sooner. There were various inescapable combos with minor advantages, but the character that benefited most from it was undoubtedly Little Mac, who could follow up with a KO Uppercut. Mega Man's grab release animation prior to update 1.0.4 was very similar to Wario's except that Mega Man isn't released as high as Wario allowing for many inescapable combos to also work on Mega Man including the aforementioned KO Uppercut. Unlike Wario, Mega Man can only be air released while grounded by Yoshi or Wii Fit Trainer. Yoshi could hit Mega Man with a guaranteed Up Smash in versions prior to 1.0.4. The aforementioned grab release glitch was not patched in Smash 4 until update 1.0.4 meaning that characters such as Sonic could not reuse their up special moves if grabbed out of them followed by an air release. Jigglypuff can be comboed out of a grab release by several characters (such as Shulk) due to its unusual air release as Jigglypuff is very floaty. Rosalina has true grab release combos with the help of Luma. Placing Luma in a specific spot with Luma Shot and using grab release at the right distance from it can lead into many different moves. Keep in mind this will only work if Luma is not synced with Rosalina, as it has special animation for when Rosalina grabs an opponent. Ganondorf and Captain Falcon both have a grab release combo at ledges against Ness and Lucas, where they can follow up with Wizard's Foot and Falcon Kick respectively at all percents. Both Ness and Lucas have an unusual air release animation, which sends them outwards and away rather than "dropping" downwards like most other characters. Both the speed and horizontal distance that Ganondorf's and Captain Falcon's down specials possess allows them to capitalize on this leftover Brawl air grab release animation unlike any other character. In particular, Ganondorf's has much higher knockback than Falcon's, making it a more reliable kill confirm over his. In comparison, Falcon has a much easier time grabbing opponents over Ganondorf due to the speed and range it covers, which makes it more feasible to actually grab either Ness or Lucas at the ledge. Lucina and Marth can combo any opponent after an air release with the custom up special move Crescent Slash, due to its arc and attack speed. Snake can potentially combo his grab release into one of his explosions when they self detonate (such as his grenades or C4) although this is highly impractical to set up. Grab releases in the original Super Smash Bros. Grab releases do not exist in Smash 64; a grab always lasts the same amount of time, and once that time is up, the character will automatically use a forward throw. Grabs cannot be mashed out of in this game, and the only way to escape grabs is if the victim is hit hard enough by a bystander's attack, in which case they will take the knockback of that attack. Donkey Kong's cargo release available in his forward throw may be considered a pseudo-grab release, due to DK losing hold of the opponent so they are vulnerable in front of him for a few moments (allowing techniques such as the infinite throw trap), but it is more of a way the throw works rather than an actual grab release. It is currently unknown why Ness, Lucas, Jigglypuff, Bowser, and Donkey Kong have different grab release frames from the rest of the cast in Brawl. It is commonly believed that this was done to intentionally buff or nerf these characters, but there is no evidence supporting this, and many have stated that this is not an effective way to buff or nerf the characters. The usage of grab release combos in tournaments has also been debated. Many claim that exploiting grab releases is an unfair disadvantage for the affected characters, as many of these combos can lead into guaranteed KO moves, and some are even zero-deaths and infinites. Grab release combos have been cited as the reason for Ness's and Lucas's lower tier placements throughout Brawl's history, and zero-death grab release combos in particular have been criticized for making certain matchups nearly unwinnable for affected characters. Others however, have argued that grab releases are a part of the game that must be dealt with and are an inherent strength/weakness to characters affected by them, and that they aren't functionally different from standard combos. There have been some tournaments that have banned these grab release exploits (typically the grab release chain grabs on the PK kids), though this rule occurs only in fringe locals and has never been implemented in more major tournaments, as competitive players generally maintain that all techniques are fair game to use unless demonstrated to be broken. They also maintain that tournaments should be discouraged to implement rules just to arbitrarily buff or nerf certain characters and that "complex bans" should be avoided. However, while competitive players generally accept grab release exploits, they generally don't like them, and as such, all the major Brawl mods have made efforts to remove all potential grab release followups. This page was last edited on April 15, 2019, at 20:11.